Dr. Nadine Koreman graduated from the Western College of Veterinary Medicine in 1992. She opened the clinic in 1996. The challenge, unpredictability and the opportunity to make a big difference to our patients in a short amount of time is what drew Nadine to emergency medicine. 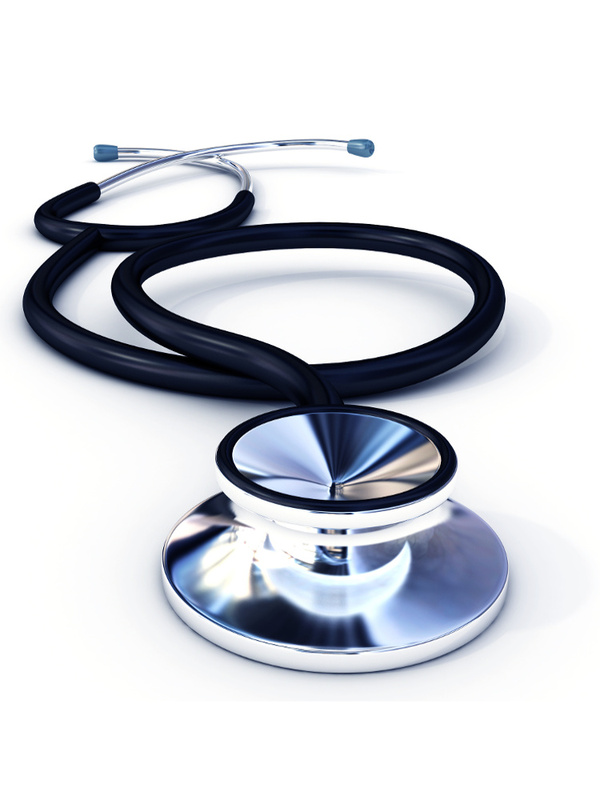 She enjoys the wide variety of cases that continue to amaze her as well as the great group of staff here. When she has free time she enjoys travelling and puttering around the farm in addition to training, breeding and showing Golden Retrievers and riding, showing and breeding horses. Dr. Kessler graduated from The Ohio State University in 1996 and joined our team in 2010. For as long as he can remember he has endeavored to help sick and injured animals. 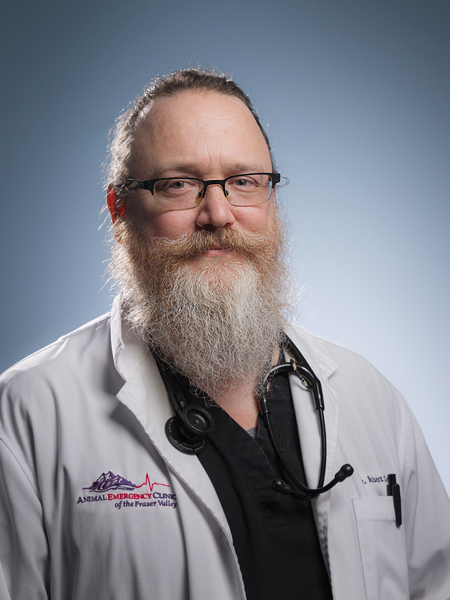 Rob has spent his whole career as an ER vet and loves working at such a high quality state of the art emergency and critical care facility. He enjoys spending his free time with family exploring beautiful British Columbia. 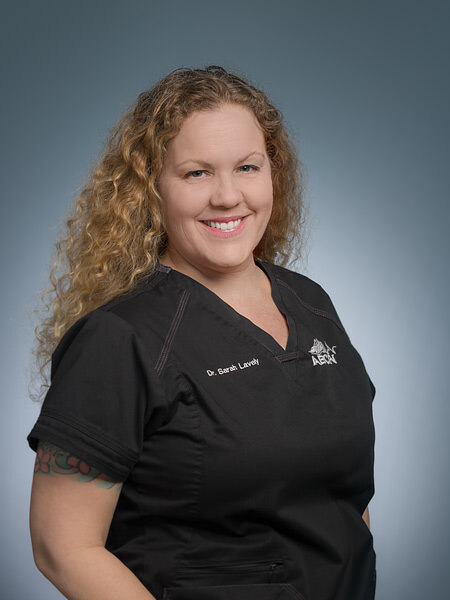 Dr. Sarah Lavely graduated from the University of Pennsylvania in 1997 and joined our team in 2017. Sarah is interested in emergency medicine, acupuncture, preventative care, nutrition and owner education. Dr. Patterson graduated from the Western College of Veterinary Medicine in Saskatoon in 2017. Following that, she did a critical care focused internship at Gulf Coast Veterinary Specialists in Houston, Texas. 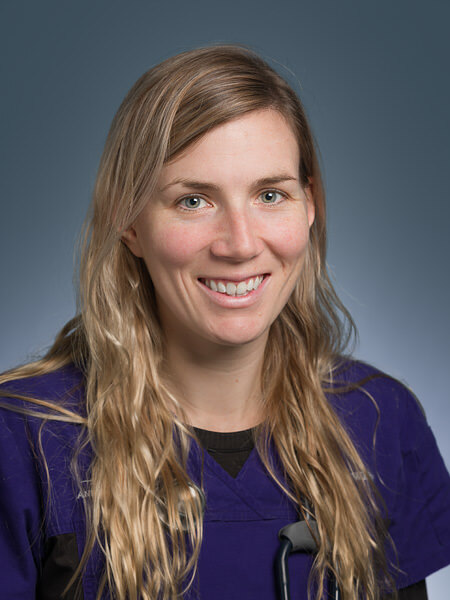 Erin joined us in 2018 to focus on growing her skills as an ER clinician. Erin really enjoys the pace and variety of ER medicine, and finds it rewarding to help pets and their families through difficult situations. Outside the clinic she enjoy snowboarding, camping and spending time with her boyfriend and pets. Dr. Kari Christianson is a native of Arizona, USA. 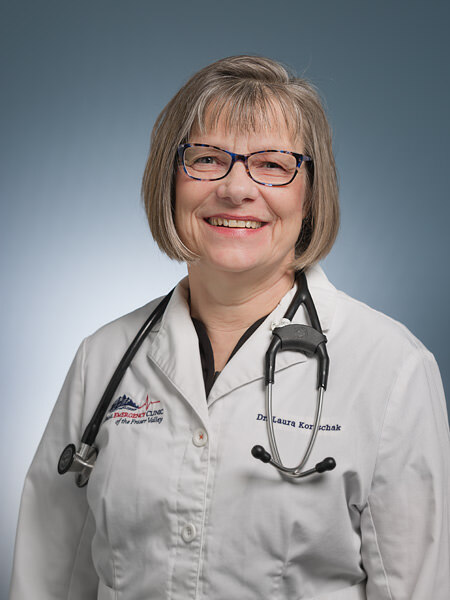 After receiving a Bachelor of Science in Genetics from Iowa State University and her Doctorate of Veterinary Medicine from the Iowa State University College of Veterinary Medicine, she practiced on the Oregon coast before returning to Arizona. Kari joined our team in 2018. 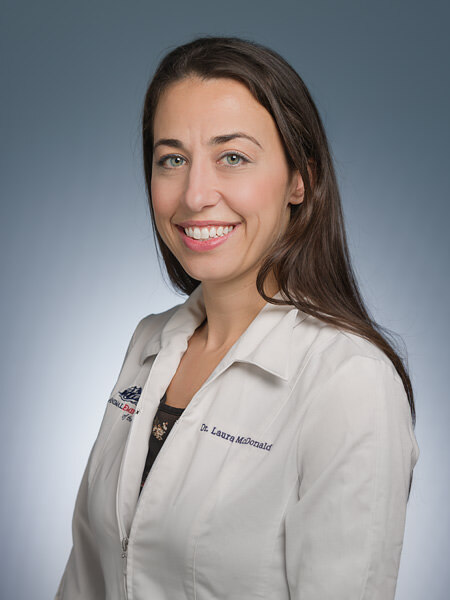 She has special interests in nutrition, soft tissue surgery, and emergency and critical care medicine. She lives with her horse, dog, and two cats, spending her free time enjoying hiking, rock climbing, horseback riding, training for search and rescue, and exploring her artistic side with, music, drawing, and painting. Dr. Jane Milner graduated from Glasgow University Veterinary School in Scotland in 2004 and joined our team in 2013. Jane enjoys the challenge of the unknown in Emergency Medicine, and knowing we are making a difference at some of the hardest times for people and their fur-friends. When she is not working she enjoys skiing in the winter, kayaking in the summer, and the many critters she calls family. Dr. Nina Gauthier graduated from the Ontario Veterinary College (OVC) in Guelph in 2014. She worked in a very busy general practice in Montreal, her hometown, seeing everything from routine appointments to emergencies until she joined the team at AECFV in 2018. 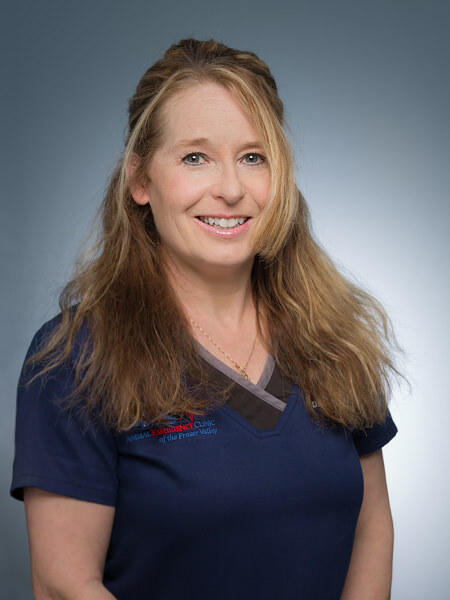 Outside of veterinary medicine, she enjoys cooking, traveling, staying active, hiking, reading, and exploring beautiful British Columbia with her family and 2 lovable chihuahuas. Dr. Cherri Beltran graduated in 1998 from the Ontario Veterinary College University of Guelph and joined our team in 2010. The variety of cases, problem solving and the collaboration with peers and specialists are what she enjoys about working in Emergency Medicine. In her spare time Cherri enjoys travelling and staying fit. Dr. Deanna White graduated from the Western College of Veterinary Medicine in 2015 with distinction. She then did a rotating internship at the Calgary Animal Referral and Emergency Centre in conjunction with the University of Calgary Veterinary Medicine. Following her internship she joined the team at the AECFV. Deanna’s primary interests within veterinary medicine include soft tissue surgery and internal medicine cases. 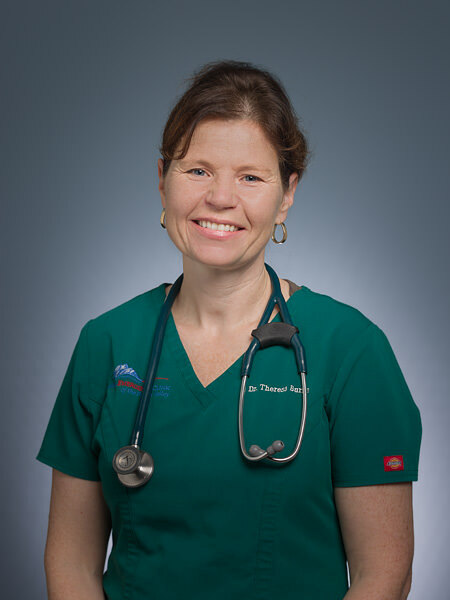 Dr. Theresa Burns graduated from the Western College of Veterinary Medicine in 1996 and became a member of our team in 2013. Dr. Burns enjoys seeing the great love people have for their animals as well as the personalities of the pets she gets to meet at work saying that there is so much variation between patients and each one is a little bit unique. Theresa is busy with a young family but finds time for the outdoors – hiking, skiing, running. She enjoys looking after horses & donkeys on her hobby farm, food gardening and learning about and growing BC’s native plants. Dr. Christine Loomis originally hails from Toronto, Ontario. She moved to Vancouver in 2007 shortly after completing her degree in Veterinary Medicine at the Ontario Veterinary College. For the past 11 years, Christine has been working in emergency medicine in the Lower Mainland. Her professional interests include Emergency care and feline medicine. Outside of work she enjoys hiking, camping and spending time with her growing family. Christine is also the proud momma of Alfie, a spunky Maltese, and two ill behaved cats, Mew and Aggie. 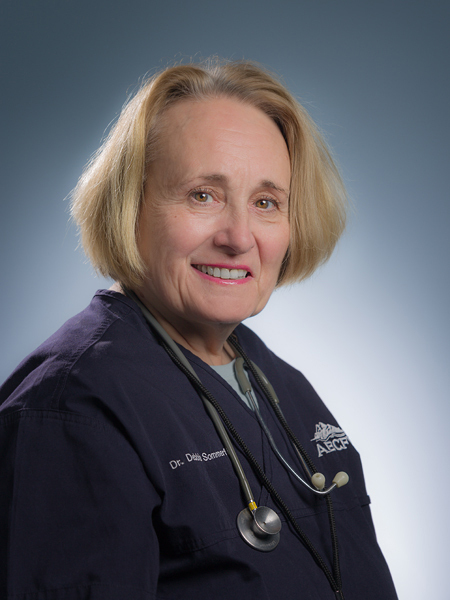 Dr. Deborah Sommerfeld graduated from the Western College of Veterinary Medicine in 1978. Deborah is interested in internal medicine and geriatrics. 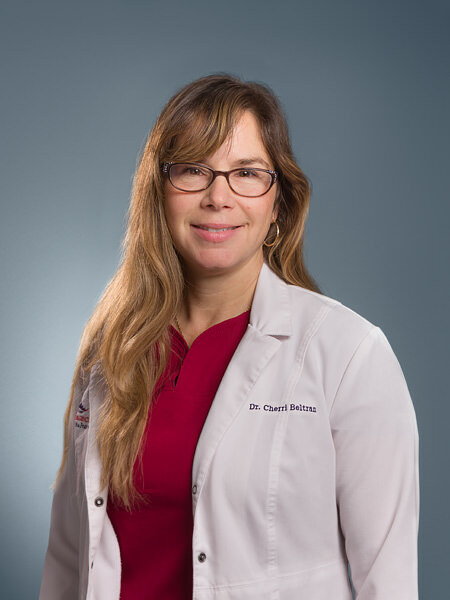 Dr. Dalia Hunter graduated at the University of Guadalajara, Mexico in 2007 and joined our team in 2019. After a small animal rotation internship in Vancouver Island, Dalia decided to relocate to British Columbia in 2007. She loves preventative and emergency medicine. Her interest include: surgery, dentistry, dermatology and small breed dogs health related issues. In her spare time, Dalia spends time outdoors with her Pomeranians, doing photography and travels the world for Continuing Education and experiences. Dr. Kortschak graduated from the Ontario Veterinary College University of Guelph in 1986 and became part of our team in 2007. Laura enjoys spending part of her time in Emergency Medicine since it helps keep her on her toes and adds variety to general practice. When she has some free time she enjoys doing agility with her lab, spending time outdoors and is involved in her Church choir as well as performing in local theatre. Dr. McDonald graduated from the Western College of Veterinary Medicine in 2011 and became a part of our team in 2015. The challenging cases, team approach and continuous learning are what drew her to Emergency Medicine. In her down time, Laura enjoys yoga and learning Spanish. She is passionate about travel and international development as well as her work with Vets Without Borders in Uganda and spay and neuter clinics in various countries around the world. 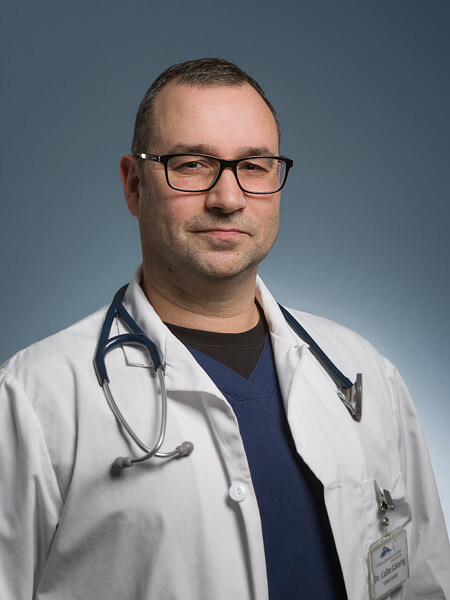 Dr. Calin Catarig graduated from the Veterinary College UASMV Cluj-Napoca, Romania in 1996. He received his Alberta license in 2007. Dr. Catarig joined our team in 2016. Calin enjoys the variety and team work approach in Emergency Medicine as well as the opportunity to do ultrasounds. In his free time he enjoys spending time with his wife and children in addition to keeping active by swimming, biking or walking his dog Jazz. Dr. Whitley graduated from the Western College of Veterinary Medicine in 1988 and became a part of our team in 1998. She likes the variety of cases and the fast pace of Emergency Medicine. Sue enjoys spending her free time on the ice playing hockey and hiking with her dogs. She also enjoys adventure travelling and has been known for having a weakness for helping cats in need of rescuing.